BOSTON --Giancarlo Stanton's recent struggles have caught the attention of New York Yankees general manager Brian Cashman, who said Wednesday that he was pleased with the way the outfielder has handled the slump that has defined the start of his tenure in pinstripes. "He's handling it with you well, in terms of how he's addressing it with the press," Cashman said to reporters just outside the visitors dugout at Fenway Park. "So I don't think it's affecting him in a poor way, that way, outside of as a competitor and wanting to succeed every time. That's something obviously that, like any competitor, he wrestles with." It was during a particularly horrid six-game homestand in the Bronx last week when Stanton went 3-for-28 (.107) with 16 strikeouts. Twice in the Yankees' season-opening homestand Stanton went hitless and struck out five times. By the end of both ballgames, fans loudly booed him. 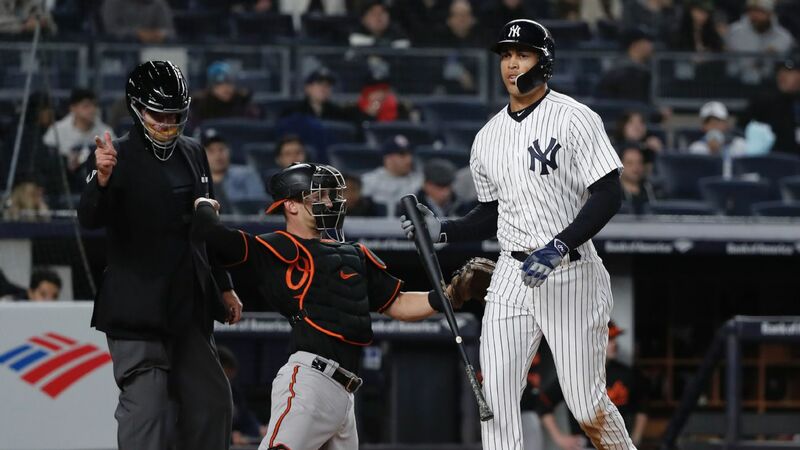 While it may have been jarring for Yankees fans to see Stanton hit such sudden lows so quickly, Cashman said he and other Yankees officials had been warned that periods like this might occur. "He's gone through these stretches, and when he goes through them, from all indication from anybody that's been associated with him says, it's a pretty rough thing to watch while it's happening," Cashman said. "And then he pops through it and gets back on track." Against the Boston Red Sox in Tuesday night's series opener, Stanton appeared to turn a corner. After going down with two swing-and-miss strikeouts in his first two at-bats against Red Sox lefty Chris Sale, he rapped a hard single through the right side of the infield and later doubled. Stanton finished the game 2-for-4, recording his third multihit game of the season. Entering Wednesday night's second game of the series, his season strikeout total sat at 22. A whopping 47.8 percent of his at-bats this year have ended in strikeouts. Stanton said his approach on and off the field has remained the same all season. "Just watch film, settle down, make sure I'm not trying too hard and trying to do too much, which could subconsciously creep in, no matter what," he said. "That's the main thing, just get a good pitch to hit and don't worry about the outside noise." The noise from sports-talk radio to social media to tabloid headlines around New York have been critical of the slugger in recent days. Cashman, who traded for the reigning National League MVP in December, said Stanton has taken the criticism and difficult questions asked of him in stride. "Obviously, entering the New York market, it's important for him to do what he's been doing, which is stand up and face the music and push through it and battle through it, and hopefully the questions can turn to somebody else and he can get back on track," Cashman said. "In this town, with this type of coverage, you're judged a lot of different ways. Not just by your performance, but also how you handle your good times and your bad times. "It's about being a professional. And I've seen nothing but professionalism from him. Whether it was when he first got here and had the successful first game of the season and the struggles since, he's still -- at least my sense from what I'm watching and reading -- is that he knows there's a job to do before the game and after the game, as well as during the game, regardless how he performs. That's important."